Being a celebrity is not an easy thing, you are always under the scanner of the media. Daily we hear and read many rumors related to the love life of our celebrities, daily so many new love stories takes birth by the day and ends by night. Recently, the gossip mills were churning out many stories about the rumored couple KL Rahul and Nidhi Agerwal. The rumors were on it’s peak that the cricketer KL Rahul is dating the Bollywood actress Nidhhi Agerwal. It seemed like another Bollywood-cricket jodi was on it’s way. Nidhhi Agerwal made her Bollywood debut alongside Tiger Shroff in the movie ‘Munna Michael’. Recently, they were captured by the papprazzis outside a famous restaurant in Bandra Corniche. The pictures of them have gone quite viral on social media and have been catching a lot of eyes. Sitting here and reflecting on life like…. NAHH!! Just thinking about Ice Creams.???????? ???? 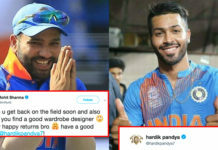 Well, KL Rahul hasn’t opened up about it yet, we really wonder what he has to say about this.